Hello, if we were having a coffee this week it would be in the same mugs as always because I’ve resisted buying more. For some reason I like buying mugs and I’ve resisted this week. 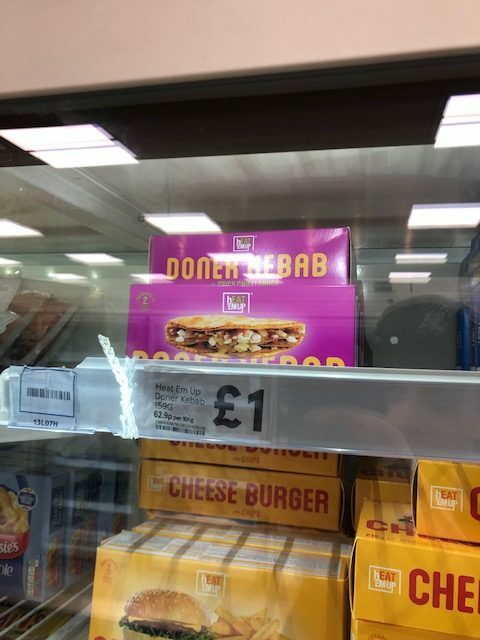 Let’s not have it with a frozen donner kebab. This week started in bizarre fashion on my journey to work as I narrowly avoided driving in to a flying mattress. It’s been a little breezy this week and I was following a flat bed truck (I’m not sure that that’s the right name – it was like a big pick-up truck) in the car. I was watching it with interest cause none of the rubbish it was transporting was netted and I could see it moving. There was a big heavy duty bag (the sort that is normally used to transport gravel) and planks for wood amongst other things. Just as we were driving past a college the double mattress took off. I swerved round it and it landed on the footpath which, luckily, no-one was walking on. There’s a line somewhere trying to stop the truck turns in to road rage and I’m not quite sure where that line is. I tried beeping and I tried flashing my lights but the guy just seemed to go on his merry way, shedding a bucket and a random bag of rubbish too before I reached work. So that was my Final Destination moment for the week! Last week when I did my weekend post I was in a pretty bad mood. The thing hasn’t got entirely better, but I feel better given that I’m not the only person to notice how unacceptable it’s been and are doing something about it. I haven’t run as much as I wanted to this week because of the weather, but it still feels like my week is dominated by planning to run. I’m exceptionally tired at the moment and I think this is probably the reason why. This is probably the reason these posts have been a little boring over the last few weeks. I’ve been doing things but they’re not very interesting. Like last night, I went to a friend’s place but was so tired that we just watched TV for a bit! I did get some new Pokémon though. This coming week I want to get really on top of my diet and water intake. I also plan to go to bed at 10pm every night and just relax, so I expect that next week’s coffee won’t be overly interesting either. Hope you’ve had a great week.